Want some instant wealth? Lillian Too recommends wearing an arrowana or dragon fish ring. If that sounds like superstitious nonsense, think again. Too is very comfortably off. She's also a best-selling feng shui expert and author who will be in town to promote her line of feng shui jewellery next week. For those who don't watch Changing Rooms, feng shui is the ancient Chinese practice of creating harmony and balance within the body and the living environment to promote happiness, prosperity and good health by understanding the flow of energy or chi so that good energy is harnessed and the bad stuff is deflected. And very practical it is, too. In the Little Book of Feng Shui she suggests hanging wind-chimes, a two or nine rod crystal or ceramic type, in the southwest corner of the living room to increase your popularity. If you position a crystal paperweight on the south-west of the desk, you will create harmonious relationships, and having nine goldfish (eight red or golden, one black) inside is lucky. It certainly seems to have worked for her. This Chinese-Malaysian from Kuala Lumpur is a Harvard Business School graduate and former CEO of Grindlays Dao Heng Bank in Hong Kong. She is no new-age flake. " I came across feng shui in the 60s and early 70s. My husband and I had difficulty starting a family so when we built our new home we incorporated important feng shui features and within four months of moving in I conceived Jennifer." Her position at the bank gave her access to learned practitioners of feng shui" and the chance to see the Forbidden City and mansions that belonged to distinguished families (so she could see how they used feng shui at home). When she retired to devote more time to her husband and daughter, she started writing about feng shui. Her books include The Complete Illustrated Guide to Feng Shui, The Complete Illustrated Guide to Feng Shui for Gardens and the Feng Shui Fundamentals series. Now, in conjunction with OE Design, Too is designing the jewellery in solid 18k gold, diamonds and platinum to be sold through Partridge Jewellers in Queen St.
"Wearing auspicious jewellery enhances the personal aura, the personal space around individual. Diamonds are the treasures of the earth. Crystals are also very good for enhancing and purifying the space around you but diamonds are so much better." "The same with gold. Wearing real gold is so much better than wearing fake gold. It is these valuable treasures that bring wonderful good luck. 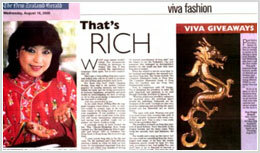 That is why I was really keen to do a jewellery line." The jewellery is based on feng shui symbols of good fortune. Too's favourite is the dragon tortoise and the three coins. They bring her success, luck and harmony, she says. For wealth and a step up the career ladder you could try something from the three-legged toad range, or for love, the double happiness pieces would be best. It's that easy, according to her. And unlike Too, you don't have to go to Harvard or become a banker to attract wealth. Just wear the ring.